‘Video Nasties: The Definitive Guide Part 2 – Draconian Days’ gets a release date & Preview screening! Alicia has started getting these very noisy, and disturbing phone calls. The question is, are they real, or is it all in her head? Zambrini: Yeah, you know, always on a full moon the pigs get hungry. Yeah. I gotta do it. They got used to eating human flesh. I gotta do it. I'm sorry. You know the first time it happened was an accident. They got loose in the field. There was a drunk. He was asleep. Yeah, he was asleep. Q: Is this movie about pigs killing people? This film has many titles. Among them are "Pigs" "Daddy's Deadly Darling" and "The Strange Exorcism Of Lynn Hart". It was meant to be a star vehicle for the director, Marc Lawrence's daughter Toni Lawrence (if only she could act!) but turned out to be one of the only movies she ever made. It is filmed in the style of a "Last House on the Left" or "Texas Chainsaw Massacre" that grainy style of film making that always gives the viewer that "not so fresh" feeling. 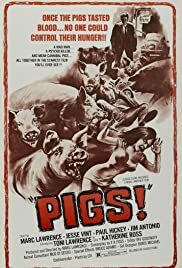 An often overlooked cult classic in it's own right "Pigs" is worth a one-time viewing for die hard horror fans but viewers beware the version currently in circulation that is being distributed by Troma is actually a censored version of the film (why anyone would care to bother censoring a film with so much of NOTHING in it is beyond me) it is missing a few key scenes (such as a scene where a victims hand is fed to the pigs) and is disappointingly void of extras (I would LOVE to hear how Marc Lawrence feels about this film nowadays or at least see the theatrical trailer for this sleaze fest).